Well, 2016 is winding down to a close and I think I speak for most people when I say, "good riddance." Between the political turmoil, the unusually large amount of famous musicians biting the bullet and, again, the political discourse, it's been a rough go. However, on the flip side, the Cubs did finally pull it off and win the World Series and that was pretty damn cool; so, it clearly wasn't all bad. 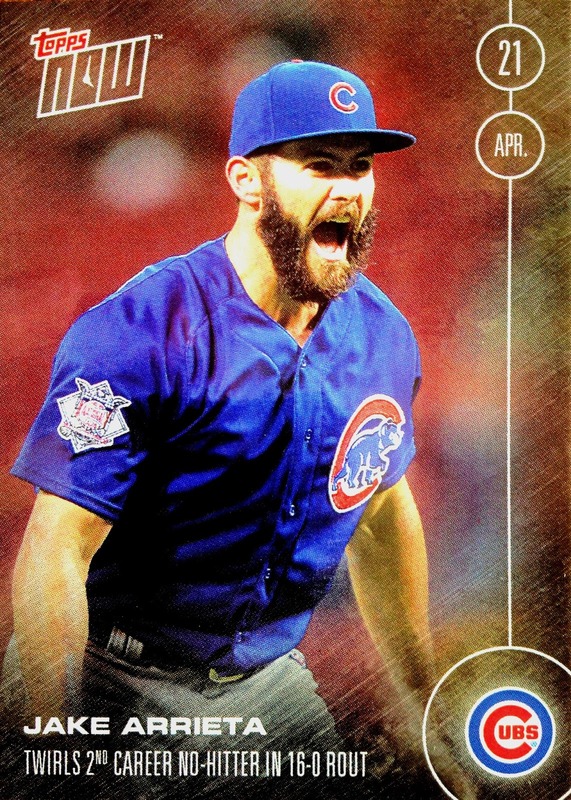 It wasn't all bad on the baseball card front either, though we did do some belly-aching about this year's Flagship design, the price point of Topps Now and the ludicrous nature of sets like Transcendent. In fact, there were plenty of cards to hit the market in 2016 that were quite pleasing to the eye. Anyone familiar with 80's hard rock/hair metal should recognize this art. I'm not going to lie, this graphic was a ton of fun to make and I probably spent more time on that than I did on the countdown itself. But, I like what I like and I know what I like, so that part was pretty easy. Whipping this bad boy up? That was a little more tedious (still fun though). 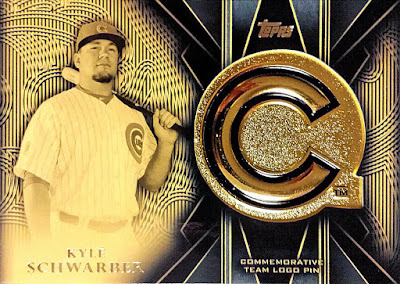 We kick things off with a relic of the manufactured variety, which was generously gifted upon my by fellow Cubs blogger Andy, from Ain't Nobody Got Time for Cardboard. Usually, manu-relics don't really capture my attention; however, the sleek black and gold, Gatsby-esque design definitely draws me in this instance. Fun fact - my wedding colors are actually black and gold; so, that should say something about how I feel about that color scheme. 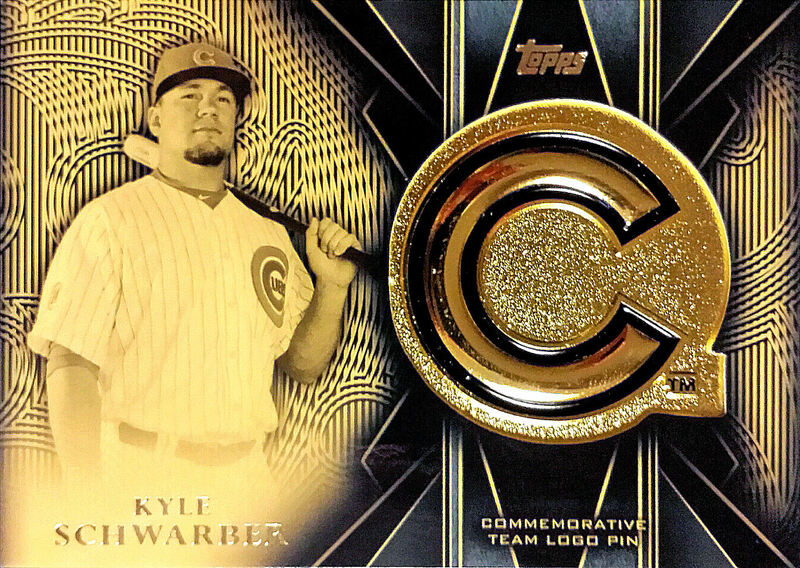 Plus, it features Kyle freakin' Schwarber. I'll always have time for this card! Back to back appearances for Schwar-bomb kicks off this countdown, this one an insert from my favorite new product of 2016: Bunt. The physical version of Topps popular online card trading app presents a set with a cheap price point, decent-looking base set, and fun inserts without the focus on mega mojo hits. So, it only seems appropriate that my favorite card from this promising product should make an appearance on this list. 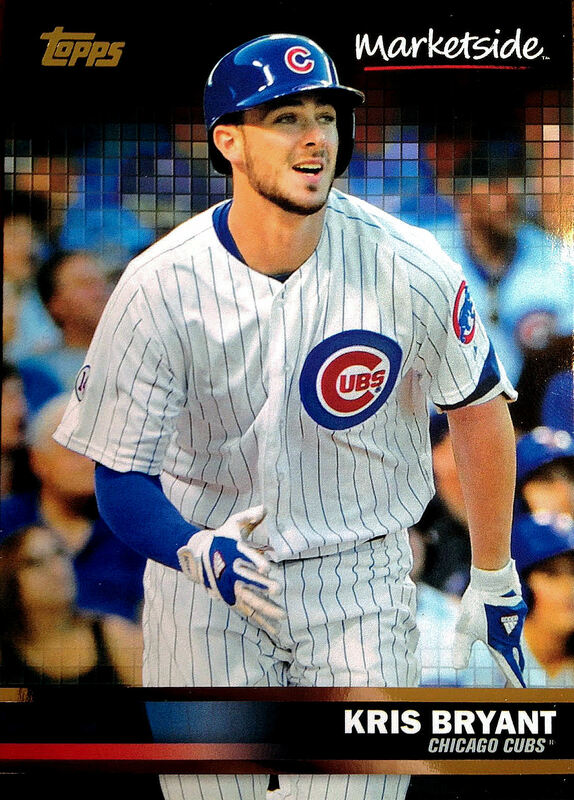 That said, I kept this list limited to cards in my possession; otherwise, the Program insert of Kris Bryant would easily take it's place. 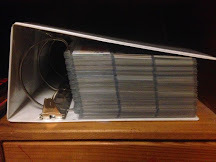 We all know that the parallel explosion in baseball cards has gotten out of hand. 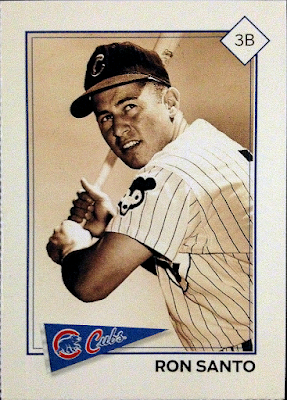 But, that doesn't mean that all parallels are bad; in fact, I enjoy parallels which are color-coded with the team depicted on the card itself. 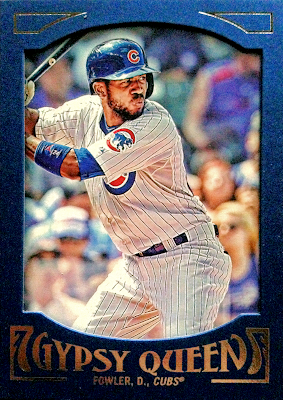 Therefore, I absolutely adore these blue-framed parallels from GQ - they look exquisite when paired with a Cubs player and the raised frame gives them an almost high-end feel. Clearly, Andy from Ain't Nobody Got Time For Cardboard gets me, seeing as this blue-bordered beauty is already the second card on this list which came from him. That exciting finish was instantly seered into my memory - Wrigley was absolutely rockin'! Thanks for this card go out to CardboardJones, of Collating Cards fame, who sent me nearly the entire insert set in one trade package, earlier this year. Okay, this selection isn't necessarily about the card itself - we've got a hazy, cloudy background and an unflattering, upwards-angle shot of the utility infielder. But, it's not about the looks with this one; rather, it's about the fact that it exists at all. I thought that Mune was going to be a Blue Jay in my CATRC binder forever, since bottom of the bench players rarely get love from the card producers and he only appeared in a handful of games. 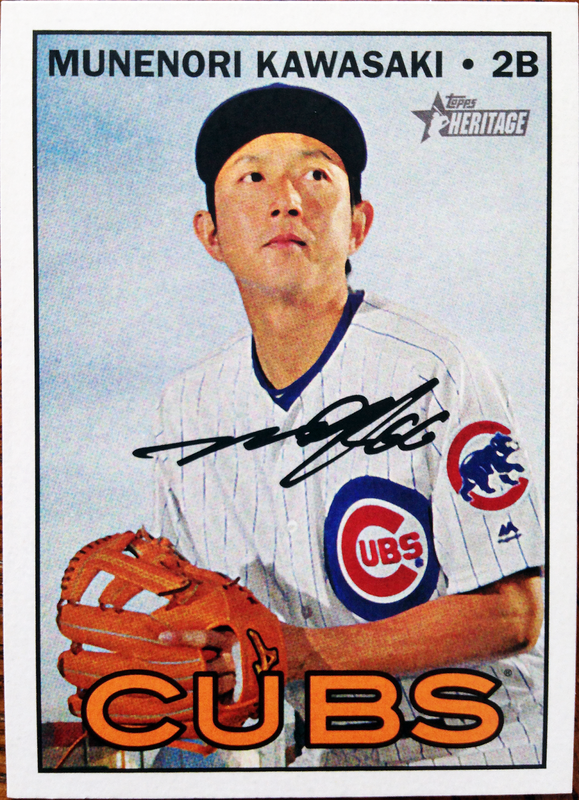 Lo and behold, Topps stepped up to the plate in Heritage High Numbers and now he's going to be immortalized in my number one collection, in the proper colors. It was an exceptionally pleasant surprise! 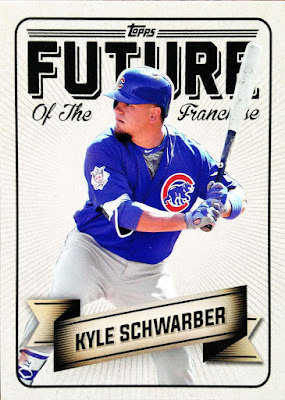 Topps Now has it's up and downs in the minds of we collectors. On the downside, it's expensive and the moments selected for cards often slant towards the big market clubs/players. On the upside, it offers an instant, tangible, collectible memorabilia of major events in baseball history. For instance, thanks to Topps Now, I was able to get this awesome, celebratory shot of Jake Arrieta celebrating his second career no-hitter shortly after it had happened. As one of the most exciting moments in the most enthralling season of Cubs baseball in a century, that's pretty nifty. Thanks go out to Addiction as Therapy for sending this one my way. Remember what I said earlier about blue parallels and Cubs cards? Well, that definitely comes into play again here, with this awesome autograph from someone who turned out to be a major player in the Cubs' incredible World Series run. It might be a sticker 'graph, it might be an unlicensed card (though it's hidden fairly well), but it will always be a colorful, John Hancock of a World Series hero! Also, the photo here truly doesn't do the card justice - the blue foil is quit reflective and almost rainbow-ish. One of my favorite, if not my favorite, developments in the card-collecting world this year was the long-pined for return of retail oddballs. Remember all of the fuss the Marketside pizza promotion at Walmart caused amongst collectors? I personally bought three more of the "ready made" pizzas than I ever would considered otherwise, in search of the two Cubs on the checklist. This set, in my humble opinion, was much nicer than the Flagship product and I was super excited to pull this KB from one of my "pizza packs." Here's hoping we see more of these kinds of "oddballs" crop up in 2017. Speaking of oddballs, number two on this list belongs to a true oddity - one that has no ties to Topps, Panini or any other major card manufacturer. 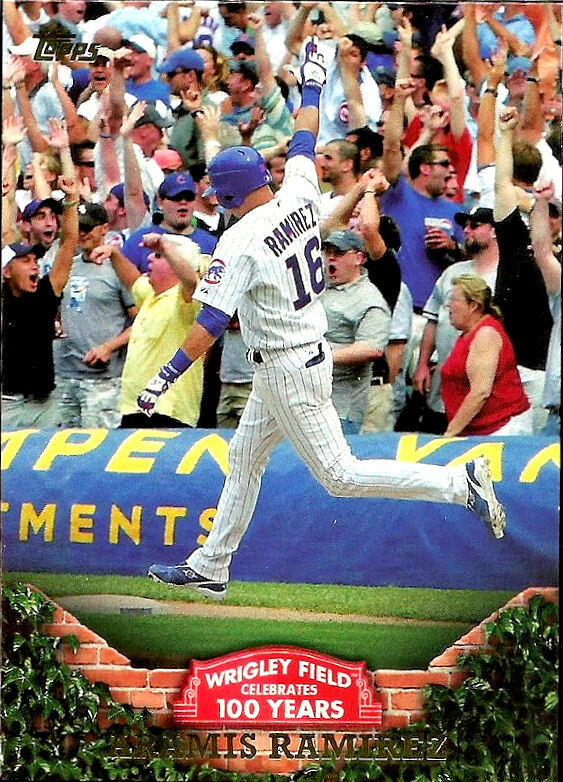 When I found out that the Chicago Tribune had published a baseball card in their Sunday edition a few months back, I'm not kidding when I say that I instantly dropped everything I was doing to run to CVS and pick up my copy. The only Cub to make the panel was a young Ron Santo, who just so happens to be my favorite player of all-time and a HOF'er who's been unjustly ignored by those major manufacturers. 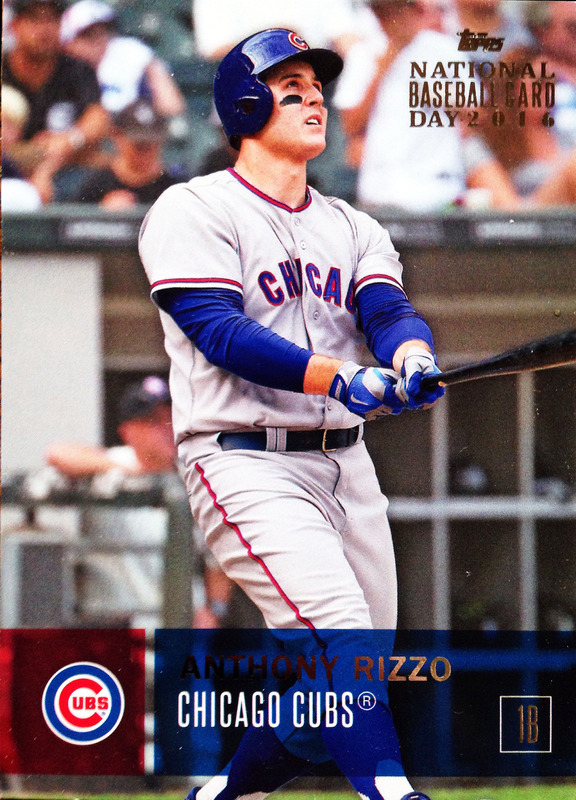 National Baseball Card Day made it's return this summer with an LCS exclusive set and when I first saw this Rizzo, I knew I had to have it. The team color-coordinated nameplate, the follow-through and admiration of what I will assume was a moonshot and the spectacular late-60's road throwback (complete with stirrups!) sported at what I will forever call Comiskey Park... what's not to love? 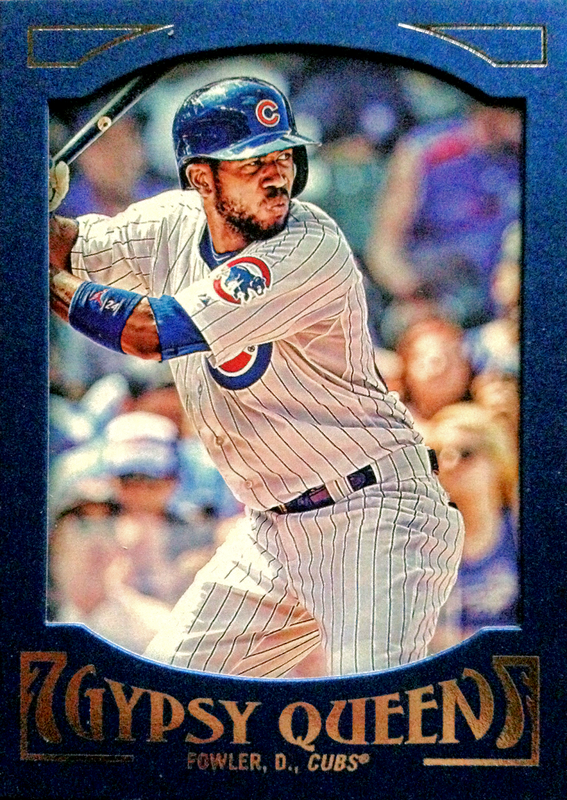 This card truly has it all, at least in the mind of this Cubs collector, earning the number one spot. There you have it, the Wrigley Roster Jenga "Final Countdown" of my favorite cards from 2016. We laughed, we cried, we saw some lovely baseball cards and we partook in a nice exercise of positivism. Thank you for this clever contest idea, P-Town Tom! I encourage you all to participate as well and show off your favorite card of 2016 - I know I'm curious as to your selections. I've been saying that 2016 has been the worst year ever - unless you're a Cubs fan. 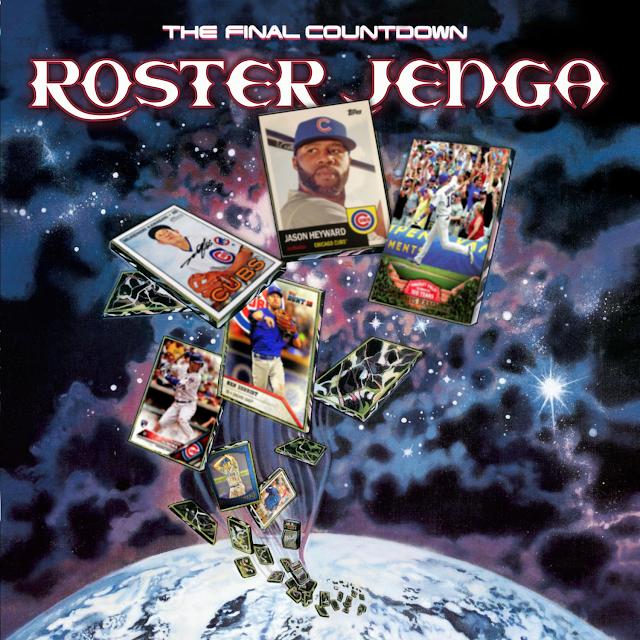 This is a cool idea for a contest and you took it to another level with 'The Final Countdown'...now I'll have that song stuck in my head all day! Great song though.. and the time you spent on that graphic was well worth it. 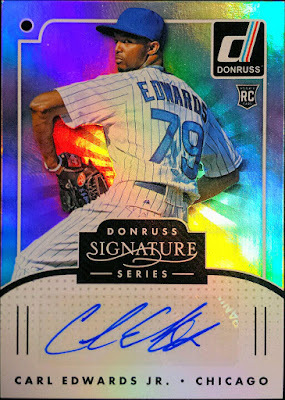 Carl Edwards Jr sounds like a great NASCAR name. And I'd have trouble deciding between your top three - the Rizzo throwback uni is tough to beat though. That countdown art is seriously impressive. At least one of the cards on your list is in the running for my entry in this contest. I like your #1 pick. I have that card but never really looked at it that closely and totally missed the stirrups until now. 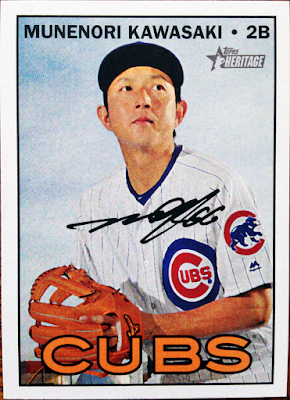 I know it was a longshot... but I was really hoping Mune would make the Cubs playoff roster. At least he made your list. This Post Brought to You By the Letter "U"
Would You Like Some Pie with Your Pie?